DOVER, Del.—Victory in Friday's Lucas Oil 200 wasn't the only thing Kyle Busch gained at Dover International Speedway. He also gained a healthy dose of respect for NASCAR Camping World Truck Series rookie and second-place finisher Cole Whitt. Pulling away from Whitt's No. 60 Red Bull Chevrolet after a restart on Lap 198 of 200, Busch won the race under caution when Nelson Piquet Jr. and Timothy Peters wrecked on the final lap. 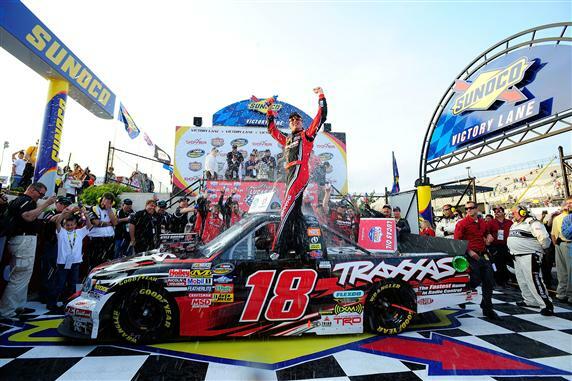 Busch picked up his third truck series victory in five starts this season. Busch won for the second time at Dover—becoming the first repeat winner here—and for the 27th time in the series. Matt Crafton came home third and claimed the series points lead. Austin Dillon and Kevin Harvick ran fourth and fifth, respectively. "Cole Whitt did a really nice job," Busch said in victory lane. "I think he's got something going on over there. The guys do a really nice job, and he's fast. He's quick week in and week out, and this is the first one he's really contended for—that I've been in, anyway." After a long cycle of green-flag pit stops, Busch held a lead of nearly 12 seconds over Ron Hornaday Jr. when NASCAR called the fifth caution of the race for debris on the backstretch. Jason White and Whitt, who took two tires to Busch's four under the yellow, took the green flag side-by-side on Lap 161. Whitt powered his No. 60 Chevrolet into the lead after the restart, with Busch in pursuit. Whitt opened an advantage of roughly one second before Justin Lofton's spin on the backstretch on Lap 178 brought out caution No. 6 and bunched the field for a restart on Lap 184. Busch charged into the lead from the inside lane on the restart and held it for a lap before Craig Goess' wreck caused the seventh caution. Not surprisingly, Busch chose the bottom lane for the restart on Lap 192 and quickly pulled away. "I snookered him (Whitt) on the second-to-last restart, and I got him a little bit there, but on that last restart, he was right with me. We ran down into Turn 1 side-by-side. I chose the bottom because I felt like, running through (Turns) 1 and 2 wide open, it was the faster way around." But Parker Kligerman, who had run in the top 10 for most of the race, spun and tagged the outside wall under close racing with Whitt on Lap 193. The resulting caution forced the final restart on Lap 198. Though his first win eluded him, Whitt had much to celebrate. "Running second to Kyle—a good points day for us—it's like winning the points for us," Whitt said. "We'll take that and move on and go to Charlotte (May 20) and try to win one there." Busch and Harvick, both on probation for an altercation at last Saturday's Sprint Cup race at Darlington, competed without incident on Friday. The drivers raced for the lead after a restart on Lap 81, with Busch getting the advantage, but a subsequent pit-road speeding penalty to Harvick separated them for the rest of the race.